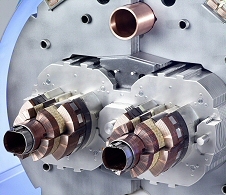 Bilfinger Noell supplies superconducting magnets for particle accelerators such as the LHC at CERN and FAIR at GSI. Even before manufacturing the magnets, we support our customers in finding the right design through industrial studies and manufacture of prototypes. During the course of the project, we develop necessary manufacturing equipment and serial production based on our customers’ specifications.